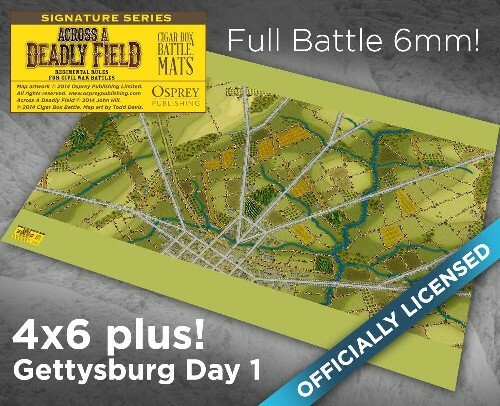 This Officially Licensed terrain mat, brought to you by Osprey Publishing and Cigar Box Battle will allow you to refight the entire "First Day of Gettysburg" scenario from the "Across A Deadly Field" scenario book "The War in the East". The printed, playable surface on this mat measures 45" x 76"(mat size is 56'x76") . It comes as pictured and features fences, buildings and all terrain printed on the mat for ease of set up and play. You can play with the 2D printed mat terrain "as is", or layer 3D terrain over the mat and place cardboard or foam hills underneath to represent the rolling terrain around Gettysburg. This mat works best with small scale figures. We recommend 6mm - 10mm. This mat is the actual artwork from the Across A Deadly Field scenario book and was designed by Todd Davis and John Hill.